A natural timber plank with 6 coloured blocks alternating along the length of the plank to give additional variety and visual interest. 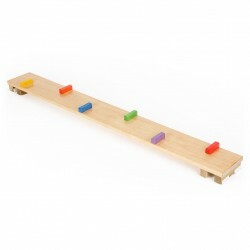 The blocks are coloured red, blue, green, yellow, orange and purple. Dimensions: 1830mm long x 210mm wide x 90mm high. The blocks are 100mm wide. Weight: 6.2 kg.